Aiseesoft DVD to iPod Converter is the most powerful and fastest DVD to iPod converter software for iPod Classic, iPod Nano, iPod Touch, iPhone, iPhone (3G). You can easily convert almost all kinds of DVD movies to iPod video MP4, MP4 AVC and iPod audio MP3 and M4A, AAC with the latest MPEG-4 video encoding technology. You will enjoy your favorite DVDs on your iPhone/iPod Touch/Nano/Classic and Apple TV without any difficulties. ...... Free Download Aiseesoft DVD to iPod Converter and have a try! convert almost all kinds of DVD movies to MP4, H.264, MP3, M4A and AAC for your iPod Touch/Nano/Classic, iPhone, iPhone(3G) and Apple TV. 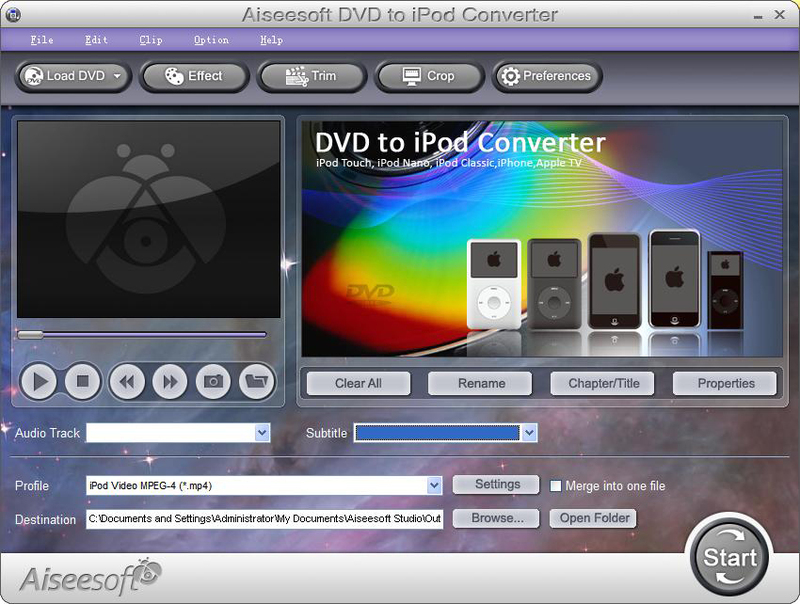 Aiseesoft DVD to iPod converter allows you to adjust video effec, crop movie and trim any segment from you DVD as you like. This excellent DVD to iPod converter allows you select audio track and subtitle for your output file. You could trim any segments you want to convert from DVD by accurately setting start time and end time or just drag the slider bar to the position where you want to stop the trimming. best DVD to iPod Converter to convert DVD to iPod MP4 video format. Qweas is providing links to Aiseesoft DVD to iPod Converter 6.2.28 as a courtesy, and makes no representations regarding Aiseesoft DVD to iPod Converter or any other applications or any information related thereto. Any questions, complaints or claims regarding this application Aiseesoft DVD to iPod Converter 6.2.28 must be directed to the appropriate software vendor. You may click the publisher link of Aiseesoft DVD to iPod Converter on the top of this page to get more details about the vendor.